UK WordPress Hosting providers offer users of the WordPress blogging service a way to download and host their WordPress account on their own servers and provide the added functionality for firewall protection and email accounts. If you’re looking for online services similar to UK WordPress Hosting, consider our Personal Web Hosting or Cheap Web Hosting service categories. 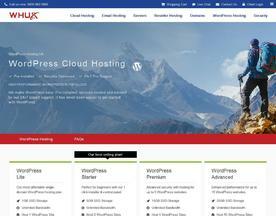 WHUK offers premium WordPress hosting service with 24/7 support, 30 day money back and 99.95% uptime guarantee. All the WordPress blogs are hosted on powerful Hexa core servers to ensure high performance and stability.